Last year saw the death of a household name in Traditional circles, Michael Davies. Along with Hamish Fraser of ‘Approaches’ and Fr. 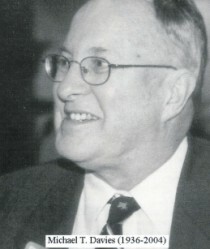 Paul Crane S.J. of Christian Order he was one of the leading figures of the fight for Tradition using the printed word. In fact, Michael Davies has had a tremendous influence on English speaking Catholics throughout the world. The present writer, himself a convert, can think back to 1984 when on a Jesuit retreat in North Wales he was given an (annotated) copy of Pope Paul’s New Mass. What was striking about the first reading of that tome was the breadth of information: doctrinal, catechetical, liturgical, theological, philosophical, historical, ethical and pastoral complexities were handled in an effortless and engaging way. Twenty years later the reader of that work is now a priest of the Society. How inscrutable are the ways of God. Michael Treharne Davies was born in Yeovil, Somerset on 13th March 1936 and although he spoke with a pleasant West-Country accent all his life and enlisted as a member of the Somerset Light Infantry after leaving school it was always to Wales, the country of his father, that he looked as his spiritual home. At twenty, while on active service in Egypt, he converted to the Catholic faith and was an enthusiastic supporter of the Council throughout the sixties. By the end of the decade, however, this enthusiasm had waned somewhat and he came into contact with Hamish Fraser, a former Communist and a convert like himself. Fraser was already producing his quarterly periodical ‘Approaches’ and Davies was soon to join him writing supplements detailing the more dangerous excesses of the post-Vatican II church. His researches led him on to write what was to become a three part work on what he called the ‘Liturgical Revolution’. As a convert he started with a short history of the Protestant reformation in England (curiously enough the subject of one of his last public addresses in January last year) showing the alarming parallels between the events of the 16th century and the self-styled ‘reforms’ of our own day. In the next of the series, ‘Pope John‘s Council’, he examined in some detail the processes of the Second Vatican Council and how it seemed that the enemies of the Church, through one of her organs previously used for infallibly defending herself against contemporary error, caused immense harm and perhaps irreparable damage to the faith of millions. The final volume, ‘Pope Paul’s New Mass’, was the longest of the three and in great detail showed the very real shortcomings of the new liturgy illegally imposed on the Church for the past thirty five years. He was not immune from criticism. Some thought the style of his books a little ‘chatty’ or ‘journalistic’ (many of his arguments ad hominem would end “Well, it’s a point of view!”). Others thought his stance towards the Society of St. Pius X after the episcopal consecrations of 1988 a little too ambivalent. Notwithstanding, the Times in its obituary (he died 25th September last year) called him “A champion of ultra-conservative Catholic doctrine” and they also remarked that, despite the purported excommunications of 1988, he refused to retract any of his praise for Archbishop Marcel Lefebvre or indeed any of the tenets of the three volumes of his own testimony to the life and work of the Archbishop the Apologia. That particular work marked the start of a long involvement with the Angelus Press stretching back to 1978. After the Apologia it was they who published his ‘Liturgical Revolution’ (he ruefully remarked, with American spelling) and a whole series of other books and pamphlets. The first two volumes of the ‘Revolution’ have been thoroughly revised and are now available from the Angelus Press. He had hoped to be able to revise the third volume which would obviously have involved a great deal of work. Given his final illness it is understandable that he put off that labour until he’d ‘had a bit of a rest’. Please remember the soul of Michael Davies in your prayers that he may now obtain the rest he has surely merited. R.I.P.